What do I need to cut SVG files? If you have a Silhouette Cameo, Portrait or the older Silhouette SD, you can cut our amazing library of SVG files using the Silhouette Studio Designer Edition software or Sure Cuts A Lot 4 software! Note: You don't need both programs, just one or the other! The "Designer Edition" is a special upgraded version of the Silhouette Studio software and does NOT come bundled with your Cameo, Portrait or SD, but upgrading is simple. You can purchase the upgrade from our sister site for $30 with a bonus $10 SVGCuts.com gift card. Not only will you have access to almost 300 of our SVG kits and collections, but you'll be able to download over 200 FREE SVG files from our blog! I already have Silhouette Studio Designer Edition and/or Sure Cuts A Lot 3! How do I get started? Update: If you are running Silhouette Studio Designer Edition V3 or later, Click Here. The information below is for Silhouette Studio Version 2. 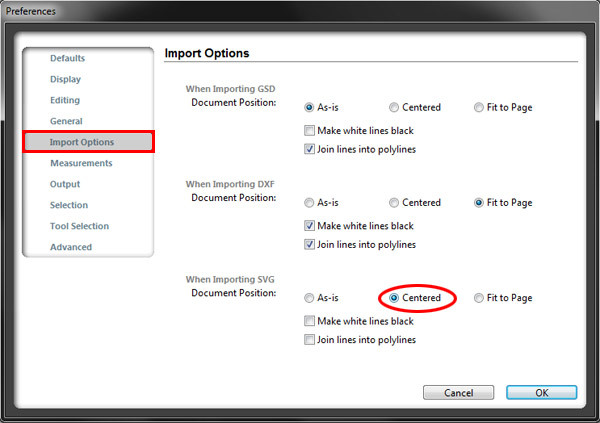 Because SVG files contain coordinate information, some of our files may import OFF of the cutting area. We've got a quick fix for that! We highly recommend updating this setting before importing your first SVG file! 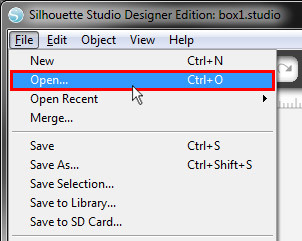 Make sure that you have Silhouette Studio Designer Edition running and follow these simple steps to get started! 2. Click on the Files of type drop-down list and select SVG (*.svg). 3. 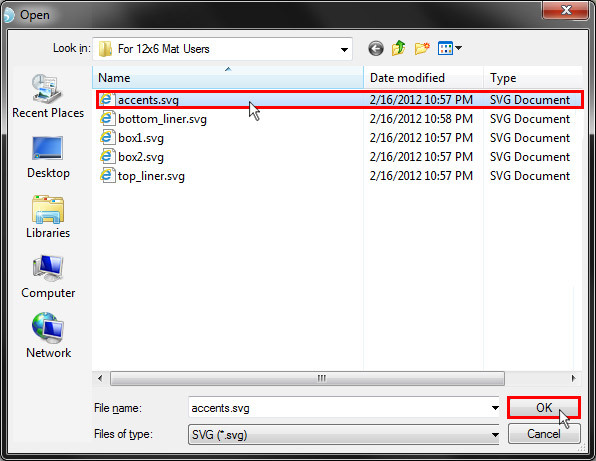 Browse to the folder that contains the SVG files you wish to cut. Select the SVG file and click OK. The selected SVG file should now appear in your cutting area. Now that the SVG file has been imported (opened), we'll need to tell the Silhouette software that we want to cut it! 4. 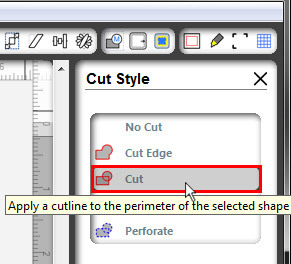 From the Silhouette Studio tool bar (on the right-hand side), click the Cut Style Window icon. 5. 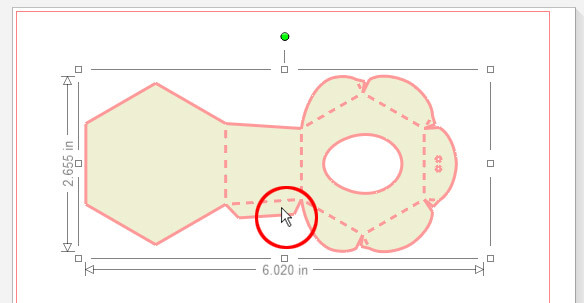 Click the shape you wish to cut in order to highlight it. Note: You'll know that you've successfully highlighted the shape when you see the bounding box indicating the shape's dimensions. 6. Select Cut from the Cut Style options. This will ensure a proper cut! 7. Click Send to Silhouette. Congratulations! You've successfully opened an SVG file and prepared it for cutting! Now simply load your mat and follow the on-screen instructions to complete your cut! Thanks for the instructions! I find it very useful. Now I know my way around Silhouette Studio Designer Edition software. I followed your great instructions for using SVG files on my Cameo. Some will not transfer, especially all your files I have downloaded in the past. What should I do as I have hundreds of SVG files I would like to use, mainly yours. Don’t want to buy MTC or SCAL since I already paid for the Designer Edition. HELP! Do you have Designer Edition? Are you running the latest version? Yes, I did purchase the Designer Edition. When the mat comes up, it says “Designer Edition” at the top. It is the 2.0.0d version.You think it needs an upgrade? Yes, there is a newer version! Hooray! This is the next day and SVG files are cutting. Thanks, Leo!!! Are the Sure-Cuts-A lot software and the Silhouette Studio Designer Edition pretty much the same, or would you recommend one over the other? Thanks. They are quite different. I would download the trial version of Sure Cuts A Lot from CraftEdge.com and see what you think! Too many differences to mention! I have followed these instructions, and still cannot get the outer edge to be traced, using the ‘trace’ feature (silhouette Designer Edition). I am trying to cut out the interior boxes for the advent calendar, and the perforations are getting highlighted. I am wondering if it is because I am using a Mac? I do not have the option to choose the file type, but have no problem importing the svg files into my silhouette program… help! Hi Marion, you shouldn’t have to trace anything. Please make sure you are following the instructions as posted. You simply import the file, highlight it and change the cut style to cut. I am also trying to cut out the advent Calendar boxes is it the Calendar by Mary Rukas ? I have had trouble also it won’t cut some of the lines out it forgets them!! It doesn’t seem to read them. I do not ask it to trace!! There is no need to! Just highlight it the file that is! Then change the cutting style to cut . Because if try and cut it It wont It will ask you for the Cutting lines. Have just tried my 3rd piece of paper for the boxes. But do you know what!! It has actually cut them all out this time!! Hurrah! How frustrating is this. As it also wastes paper! I shall try and cut the rest of the pages as am cutting out two one each for my two grandsons. Good luck let me know how you are doing. I am only a beginner really ..so we can help each other.? Hey, I have recently bought the SVG kits online and I realised that when I downloaded it, none of them has a svg version at the back, hence I am unable to open it with my Cameo designer edition. What is the problem and what should I do? Thanks! Please contact us using the contact us link at the top of our blog. our SVG files are 100% compatible with Designer Edition! I am trying the SVG file import for the first time. I am lost as to the perforated lines….do I need to make those individually and chose the cut type? Please send us a note using the contact form at the top of our page! Thank you for the clear and concise instructions. I was able to open the program and start using the SVG files with the Silhouette DE no problem! and I really LOVE the fact that the files are already pre-sized. What a help THAT is! God Bless you both and Happy New Years! Thank you so much for the instructions I am able to cut all of the SVG files I have downloaded. I did have a problem with the roof of the Peony Cottage. Silhouette DE wouldn’t let me add the cut lines. I rotated the design by 90 degrees and was then able to get the cut lines. The cottage turned out very pretty! Thank you so much – I love this website! Hi there, do I have to have a Designer Edition License? because is asking for it. We’re not sure, Lavinia! Do you? I have Silhouette Studio Designer Edition version 2.7.6d. I follow the directions above and when I click “cut” I get the following message: The page contains no cut lines. Please send a note to info [at] svgcut.com and we’ll be happy to help! Paula, SVGs (all of them, not only svgcuts.com’s) have some idiosyncracies within Designer Edition,,,,and this is one of them. if you get that message, try highlight everything on the mat and clicking on UNgroup. Sometimes you have to do that more than once, too. Another idiosyncracy is that you often need to adjust the line width on the cut lines of svgs down to 0 (many of them are 1.0 or higher),,,,,,,it’s the button with little black and white lines next to the scissors at the top of your screen. If you don’t adjust that line width, you somtimes get a crummy cut,,,,,,,adjusting that line width to 0 improves it dramatically. Those things should give you a nice cut :) Hope that helped! hi i havent have the import options where i must change ‘centered’ i can send download images to my silhouette>i already inzipped it.please help me! i cant send my pictures to the silhoutte!i download sure cut a lot 3! al the lines cut correctly from the hole desigh, but just before or after this complete, the machine cuts 2 lines straight through the picture!what do a wrong?? Make sure your software is registered! Hi, I’ve just bought a Cameo. Can I ask you how the designer edition improve the software? Just about SVG files or something more? There is a trial version to download? I’d be lost without you! This was so easy! Thank you! Hi Sue, tracing the file will cause it to cut incorrectly. You should not be tracing the SVG files. I tried to go to the sister site to purchase the designer edition bundle set, but the site was invalid. Did they change the website address? I would love to purchase this wonderful deal.